Besides browsing web content, iPad can be used to store and view personal stuff like photos, videos and lots more. Ideally, you would not like any other user to view your personal information and content stored on iPad. You can easily take care of this by securing iPad login access. 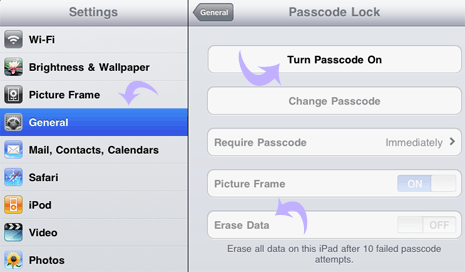 This can be easily done by adding 4 digit password code for logging into iPad device. 1. Click Settings icon on the iPad home screen. 2. Select ‘General’ option from left side and then select ‘Password Lock’ option on right side. 3. On Password Lock screen, tap the ‘Turn Password On’ option. You will get prompt to enter 4 digit code. 4. Enter any 4 digit unique number, this should be entered by you each time you want to login and use iPad. There is also an extreme security option of ‘Erase Data’ at the bottom of Password Lock screen. When enabled, 10 failed login attempt will erase all data on the iPad. Be careful!